Civil courts typically deal with cases that involve a dispute between two private parties. Civil courts handle two types of cases: family law cases, such as divorce, separation and cases involving child custody, access and support arrangements; and general civil cases, such as bankruptcy, probate matters and other claims involving money. In Canada, all divorces must be legally granted through civil court. Although divorce statistics do not capture the breakdown of relationships outside of a marriage, examining trends in divorce cases flowing through civil court can assist in understanding trends in marital breakdown, as well as the court caseload and process related to divorce. Using data from the Civil Court Survey, this Juristat article examines divorce cases within the civil court system in the seven reporting provinces and territories (Nova Scotia, Ontario, Alberta, British Columbia, Yukon, Northwest Territories and Nunavut, representing 66% of Canada's population).Note 1 Information is provided to address the following key questions: How many divorce cases are handled in civil court? How many new divorce cases are filed each year? What are the trends in the divorce caseload in civil court? How long does it take before a divorce is made final? What are the key characteristics of divorce cases that remain in the civil court system over a long period of time? A divorce is the legal dissolution of a legal marriage. Similar to the recent decline in marriages, the number of divorces in Canada has been declining in recent years. In 2008, there were over 70,000 divorces granted in Canada, a decline of 4% from the year before (Statistics Canada 2011). Divorce cases are governed by the legislation contained in the federal Divorce Act. Under the Divorce Act, marital breakdown is the only grounds for divorce and must be established by the parties applying for divorce in one of three ways: separation of one year or more; adultery; or mental or physical cruelty. The vast majority (95%) of divorces in Canada are based on the grounds that the couple has been separated and living apart for at least one year (Statistics Canada 2011). Source: Statistics Canada, Health Statistics Division, Canadian Vital Statistics, Divorce Database and Marriage Database. After the spike in 1987, the number of divorces declined, then levelled off through the 1990s and has recently decreased in both 2007 and 2008. 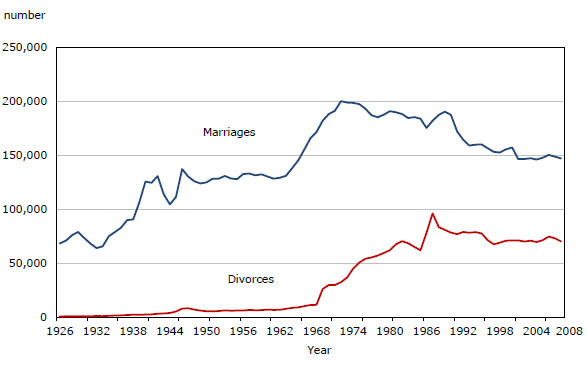 Although the number of divorces has shown recent declines, in 2008 it was estimated that 41% of marriages will end in divorce before the 30th year of marriage, an increase from 36% in 1998 (Statistics Canada 2011) (Text table 1). 1. The 30-year total divorce rate (TDR-30) represents the proportion of married couples who are expected to divorce before their 30th wedding anniversary. For example, a TDR-30 of 40.7 per 100 marriages for Canada in 2008 indicates that 40.7% of marriages are expected to end in divorce before the 30th year of marriage (if the duration-specific divorce rates calculated for 2008 remain stable). 2. Northwest Territories and Nunavut are combined to calculate the rates in this table because marriage and divorce data are not available for these territories separately for the 30- and 50-year periods required for the calculation of the total divorce rates. The rate of divorce rises rapidly in the first few years of marriage. In 2008, the divorce rate peaked after three years of marriage, when just over 30 out of 1,000 marriages ended in divorce (Statistics Canada 2011).Note 3 The rate of divorce decreased with each additional year of marriage. In 2008, about 18 out of 1,000 couples married 10 years obtained a divorce, while 10 out of 1,000 marriages lasting 20 years ended in divorce. The majority (59%) of divorces in 2008 were of couples married for fewer than 15 years. In Canada, all divorces must go through a civil court in order to be legally recognized. In 2010/2011, civil courts in the seven reporting provinces and territories handled just over 113,000 active divorce cases (Table 1). These cases represented about one-third (35%) of all active family law cases, or 12% of all active civil court cases in these provinces and territories. (Refer to Text box 2 for general trends in all civil court cases in 2010/2011.) Active cases are cases that had registered one or more events with the court during the year, and include newly initiated cases, as well as cases ongoing from a previous year. Events represent the steps needed to process the case through the court system, and for divorce cases range from the filing of documents, to case conferences and hearings, to decisions on the divorce and any related issues. Each year, civil courts handle new divorce cases initiated during the year, as well as divorce cases ongoing from a previous year. Civil courts are handling a higher number of divorce cases ongoing from a previous year. In 2010/2011, ongoing divorce cases in the reporting provinces and territories grew to over 59,000, an increase of 5% from the year before (Table 2). Increases were seen in six of the seven reporting provinces and territories, ranging from a 2% increase in Ontario and Northwest Territories to 12% in British Columbia. In Yukon, the number of ongoing divorce cases declined 4% from the year before. Fewer new divorce cases are entering the courts. In 2010/2011, almost 54,000 new divorce cases were initiated in the seven reporting provinces and territories, a decline of 2% from the year before (Table 3). Declines were seen in each of the seven reporting provinces and territories, with the exception of British Columbia where the number of new divorce cases increased 4%. The number of new divorce cases being filed in civil courts has been declining in the reporting jurisdictions for several years. Over the five-year period between 2006/2007 and 2010/2011, the number of new divorce cases declined 8% in six reporting provinces and territories (data for Alberta are not available for part of the time period), steadily decreasing 2% each year (Table 3). Drops ranged from 4% in British Columbia to 22% in Nova Scotia.Note 4 Alberta also saw a decrease of 6% over the three-year period for which data are available, 2008/2009 to 2010/2011. Overall, the decline in new divorce cases and the growth in ongoing divorce cases in 2010/2011 led to a small increase from the year before in the total number of active divorce cases (1%) in the seven reporting provinces and territories. In 2010/2011, civil courts in the seven reporting provinces and territories handled just over 921,000 cases (Table 4). About two-thirds (65%) of cases were general civil cases, while one-third (35%) involved family law. Of the total civil court cases, almost 494,000 were new cases initiated in the seven provinces and territories, representing a 5% decline from the year before. Fewer new cases were initiated in all jurisdictions except the Northwest Territories, where the number of new cases remained about the same. The overall civil court caseload in the seven provinces and territories was down slightly (-2%) between 2010/2011 and 2009/2010 (Table 4). The drop in the overall civil court caseload was driven by declines in general civil cases (-2%) as well as family law cases (-3%). Family law cases decreased in six of the seven reporting provinces and territories in 2010/2011, ranging from a decline of 7% in British Columbia to a 1% decrease in Nova Scotia. Family law cases increased 2% in Alberta (Table 4). There was a decline in both the number of new family cases (-4%), as well as the number of new general civil cases (-5%) in the seven provinces and territories in 2010/2011 (Table 4). 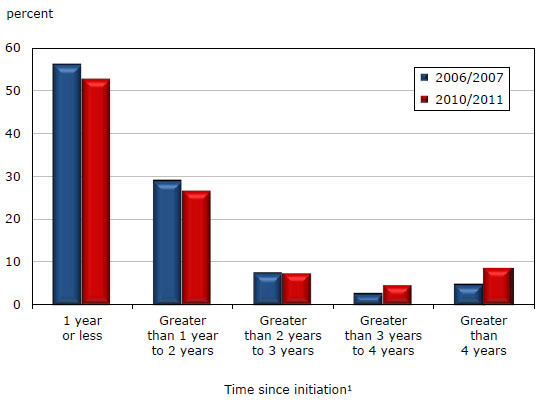 The proportion of divorce cases requiring more time in the civil court system has grown since 2006/2007. In five of the reporting provinces and territories (data were not available for Alberta and only partially available in the Northwest Territories in 2006/2007), a larger proportion of divorce cases had been ongoing over a period of more than two years in 2010/2011 than in 2006/2007 (21% compared to 15%) (Chart 2). 1. Time since initiation is based on the year of case initiation with a fiscal year end of March 31. Note: Excludes data from Newfoundland and Labrador, Prince Edward Island, New Brunswick, Quebec, Manitoba, Alberta, Saskatchewan and Northwest Territories due to the unavailability of data. Active refers to cases that had activity or were initiated during the year. Source: Statistics Canada, Canadian Centre for Justice Statistics, Civil Court Survey. The court rules in each province and territory outline the steps and forms required to obtain a divorce. To begin the process, one or both parties of the marriage must file an application for divorce with the appropriate court in their province or territory. Once filed, the court registers all new divorce applications with the federal Central Registry of Divorce Proceedings (CRDP) to ensure that no other proceeding involving the same parties has already been started elsewhere (Department of Justice Canada 2006a). The court cannot grant a divorce until a clearance certificate has been issued by the CRDP and filed with the court confirming that there are no other ongoing actions. In Canada, divorce cases are heard in the superior courts, which are presided over by federally appointed judges. The superior courts traditionally have shared jurisdiction with the provincial/territorial courts over family law issues under both federal and provincial-territorial legislation. Some provinces have established specialized courts at the superior court level, called unified family courts, which have jurisdiction over all family law matters. At present, unified family courts are available in two of the reporting jurisdictions in the study, Nova Scotia and Ontario. If the divorcing couple agrees on all issues, the divorce will proceed through court as uncontested. Generally, the process involves filing the appropriate forms and documents with the court. In most provinces and territories, the parties to an uncontested divorce do not have to appear in court before a judge (Department of Justice Canada 2006a). Instead, a judge may grant a divorce judgment after reviewing the application and the documentation and evidence filed. If the divorcing couple cannot agree on one or more issues related to the divorce, then the divorce will proceed as contested. The provincial or territorial court rules set out the steps needed to resolve the issues before the case goes to trial (Department of Justice Canada 2006a). Many of the steps provide an opportunity for the parties to come to an agreement and settle the issues before trial. For example, a pre-trial conference, such as a case conference or settlement conference, may be held. At any time during the divorce proceedings, parties can try to reach an agreement on their own or with the help of lawyers or through mediation. To finalize the divorce, a judge reviews all of the information the parties have submitted, either on the application or in the trial, to ensure all the legal requirements for a divorce have been met (Department of Justice Canada 2006a). The judge grants the divorce and sets out in a divorce judgement the decision on any issues that need to be resolved. This judgment normally becomes final 31 days after the judge signs it. Source: Compiled from information from Department of Justice (2006), Divorce Law: Questions and Answers and Ministry of Attorney General Ontario, A Guide to Procedures in Family Court. The civil court process involves various events over time as the divorce case is resolved, including document filings, hearings or conferences, judgments or other decisions. The process is generally straightforward for uncontested divorces where both parties are agreeing to the divorce and any related issues, such as support and child custody and access arrangements. Contested divorces involve one or more issues that are in dispute between the parties and the process to reach resolution becomes more complex (Text box 3). In 2010/2011, the majority of active divorce cases (80%) in the reporting jurisdictions were uncontested, with the remaining 20% being contested or disputed cases (Table 6). Contested cases remain in the civil court system longer than uncontested cases. In 2010/2011, the median length of contested cases, that is, the length at which half of the cases are longer and the other half are shorter, was 490 days, compared to 120 days for uncontested cases. Pre-trial hearings, such as case conferences or settlement conferences, may be held during a case in order to resolve matters. This kind of activity is uncommon in uncontested divorces and occurred in less than 10% of uncontested cases in the reporting jurisdictions in 2010/2011. In comparison, a pre-trial hearing was held in more than half (55%) of contested cases in 2010/2011. Given that contested cases are more likely to involve court appearances than uncontested cases, adjournments are also more common. Adjournments, suspending any hearing or trial event to another time, took place in more than one-third (38%) of contested cases in 2010/2011, compared to less than 9% of uncontested cases. There are many methods through which parties may come to an agreement on issues related to a divorce and therefore avoid going to trial before a judge. For example, divorcing individuals may use the help of lawyers or conciliation, mediation or other alternative dispute resolution services available in the provinces and territories (Department of Justice Canada 2006b). In Canada, the vast majority of divorce cases are resolved before reaching the trial stage. In 2010/2011, 1% of divorce cases in six provinces and territories had a trial during the year (excludes Ontario since figures for Ontario are not comparable).Note 10 Moreover, only 2% of divorce cases that were active in 2010/2011 in the six provinces and territories had ever reached a trial during the case. Most divorce cases that involved a trial tended to reach the trial 12 months or more after initiation. 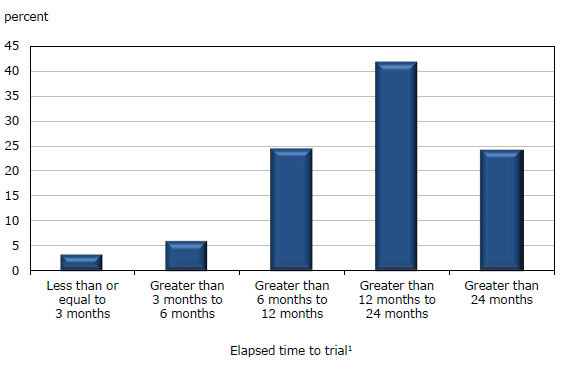 Close to one-tenth (9%) of trials were held within the first six months of the case, and another 25% were held between six months and one year. However, the remaining 66% were held during the second year (42%) or after two years (24%) (Chart 3). These findings were fairly consistent among the reporting provinces and territories. 1. Calculated only for cases where the full case history has been collected by the Civil Court Survey since a trial may have occurred in the case prior to the start of data collection. Note: Excludes data from Newfoundland and Labrador, Prince Edward Island, New Brunswick, Quebec, Manitoba and Saskatchewan due to the unavailability of data. Also excludes trial figures for Ontario since they are not comparable. A divorce is declared to have been granted when a divorce judgment is made by the court. In 2010/2011, a divorce was granted in about 38,000 cases, representing close to one-half (43%) of divorce cases proceeding through court in six provinces and territories (data are not available from British Columbia) (Table 7).Note 11 Among these cases, one-third were granted within three months after the divorce was first filed, with another 28% granted between three and six months after case initiation. The median length of time required to reach a divorce judgment was 130 days, or about 4 months, in the six reporting jurisdictions in 2010/2011. The time required to reach a divorce judgment varied across jurisdictions. The highest proportion of cases with a divorce judgment granted within three months was reported in Ontario at 41%. The lowest rate of divorces granted within three months, 8%, was reported in Nunavut (Table 7). There were differences across the reporting jurisdictions in the proportion of divorces granted after more than one year. Figures ranged from 13% of divorce judgments in the Northwest Territories to 38% in Alberta being reached after one year (Table 7). Divorce cases may involve issues that take significant time to resolve due to their complexity or the level of conflict between the parties. Some issues may also be brought back to court over time as family circumstances, such as income or living arrangements change. Thus, divorce cases may span a number of years. While the majority of divorce cases (74%) in the seven reporting provinces and territories had been in the court system for two years or less, about 13% had been initiated more than four years before (Table 5). Among the cases for which information on issues involved in the case was provided, one or more issues of support, child access, child custody and the division of marital property were identified in over one-half (54%) of cases that had been ongoing for more than four years.Note 13 In comparison, these issues were identified in about one-third (35%) of total divorce cases for which information on issues was provided by the reporting provinces and territories in 2010/2011. Most of the cases spanning more than four years had periods of inactivity during the length of the case. For example, close to one-half (45%) of those cases that had been active in 2010/2011 were inactive the previous year, that is, had no court activity in 2009/2010.Note 14 Of those cases that were active in 2010/2011 but inactive in 2009/2010, about one-quarter (27%) had been inactive one year, while another one-quarter (24%) had no activity over a two-year period. The remaining one-half (49%) had been inactive for a period of three or more years. This article examined divorce cases in civil court in seven provinces and territories (Nova Scotia, Ontario, Alberta, British Columbia, Yukon, Northwest Territories and Nunavut) using data from the Civil Court Survey. Findings show that divorce cases accounted for more than one-tenth of all civil court cases, and more than one-third of all family cases proceeding through court in 2010/2011. Each year, civil courts handle new divorce cases, as well as divorce cases ongoing from a previous year. Over a five-year period between 2006/2007 and 2010/2011, new divorce cases declined 8% in six provinces and territories (data for Alberta are not available for part of the time period), steadily decreasing 2% each year. The majority of ongoing cases were no more than two years old, although there were some provincial and territorial differences in the length of divorce cases being handled in the courts. Among divorces granted in reporting jurisdictions in 2010/2011, the majority (61%) were granted within six months after the divorce was first filed. The objective of the Civil Court Survey (CCS) is to develop and maintain a national database of information on civil court events and cases. The survey is intended to be a census of all civil court activity in Canada. It collects microdata on court events at both the superior and provincial and territorial court levels. Appeal courts, federal courts (e.g., Tax Court of Canada) and the Supreme Court of Canada are out of scope for this survey. Each in-scope event in civil court is reported to the CCS as a separate case event record. Case information is derived by matching all case events that are related to the original initiating document or event. Events are linked to a case on the basis of having the same jurisdiction and case identification number. In 2010/2011, seven provinces and territories (Nova Scotia, Ontario, Alberta, British Columbia, Yukon, Northwest Territories and Nunavut) reported to the Civil Court Survey. The collection of data is from administrative records stored in civil court automated information systems. Given that the data are derived from records originally kept for non-statistical purposes, complete survey information is not always available. For example, information related to issues, such as custody, access, support and property, may not always be available from the court information systems and, as such, may be under reported. The degree of under reporting is unknown. Given that the data collection methodology requires the existence of detailed operational information systems that have not yet been developed in all jurisdictions, it will take time for the survey to achieve full national coverage. The reference period is the 12-month fiscal period between April 1st and March 31st. Data are collected quarterly in the month following the end of the quarter (July, October, January and April). Department of Justice Canada. 2006a. Divorce Law: Questions and Answers. Family, Children and Youth Section. Ottawa. Department of Justice Canada. 2006b. Department of Justice Inventory of Government-Based Family Justice Services. Family, Children and Youth Section. Ottawa. Ministry of Attorney General Ontario. 2010. A Guide to Procedures in Family Court. Revised. June 2010. Statistics Canada. 2011. Health Statistics Division, Canadian Vital Statistics, Divorce Database and Marriage Database. Statistics Canada. 2007. Family Portrait: Continuity and Change in Canadian Families and Households in 2006, 2006 Census. Statistics Canada Catalogue number 97-553-XWE. The Civil Court Survey allows for multiple issues, such as divorce, custody, access, support, and others, to be reported for a case as the case proceeds through court. For this analysis, a case is counted as a divorce case if divorce has been one of the issues reported for the case, over the length of the case. The figures in Text box 1 are based on information from the Central Registry of Divorce Proceedings (CRDP) at the Department of Justice Canada and represent completed divorce proceedings. Figure represents the duration-specific divorce rate which is the divorce rate in a particular year for a specific marriage cohort. In Nova Scotia, the transition to new regulations for family proceedings, which came into force July 1, 2010, may account for the decrease in the number of divorce cases initiated between 2009/2010 and 2010/2011. It is important to note that differences in how cases are processed in the provinces and territories may impact results related to "time since initiation" and comparisons between jurisdictions should be made with caution. For example, depending on jurisdictional practices, a variation of an existing order or further disputes related to the same family may either be captured under the original case file (which may distribute cases toward a longer "time since initiation") (e.g., as in British Columbia) or as a new case. Provincial and territorial legislation determines these issues for married and unmarried parents seeking separation, and divorcing parents who choose to have these issues determined under provincial legislation during their divorce proceedings (Department of Justice 2006a). Certain other issues, such as the division of matrimonial property, remain under provincial or territorial law. The proportion of contested divorce cases is calculated based on active cases for which the full case history is available in the data. Cases which are not indicated to be contested in the full history are assumed to be uncontested. The comparison to 2006/2007 was based on six provinces and territories. Data for Alberta were not available for the full period, therefore Alberta was excluded. Ontario figures include trial hearings for uncontested divorces. An uncontested trial is a trial in which only the party making the claim provides evidence and submissions. The figures are therefore not comparable. On taking effect, a divorce judgment legally ends a marriage. Normally the divorce judgment becomes effective on the 31st day after the date of the judgment. The data used for this analysis are collected by the Civil Court Survey from the operational systems used to register and track civil court proceedings in the reporting provinces and territories. These systems may not capture information related to issues, such as custody, access, support and property. Information related to these issues may be under reported and findings are limited to divorce cases where the information is available. The degree of under reporting is unknown. Results related to inactivity exclude Alberta since data were not available for the full period examined.